The group minus Jeff in the famous hollow tree at Voorhees Preserve. 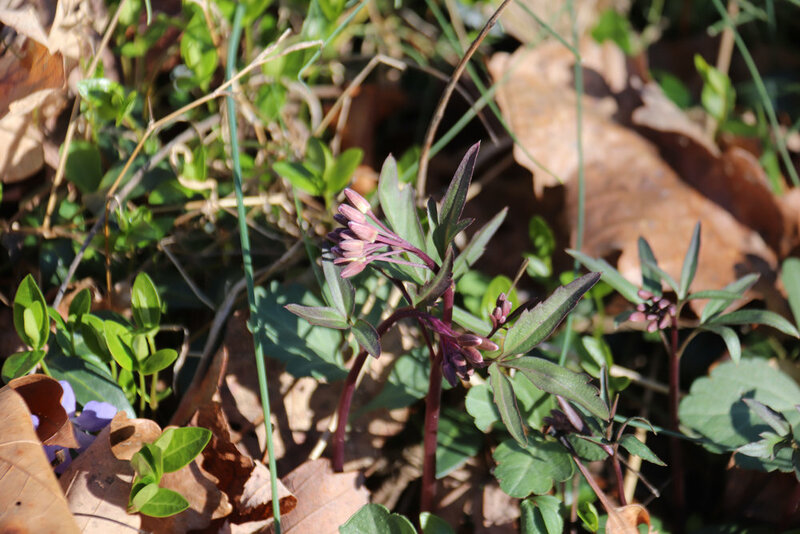 Spicebush (Lindera benzoin) and Spring beauty (Claytonia virginica) were blooming and the slender toothwort (Cardamine angustata) was getting ready to burst into bloom. 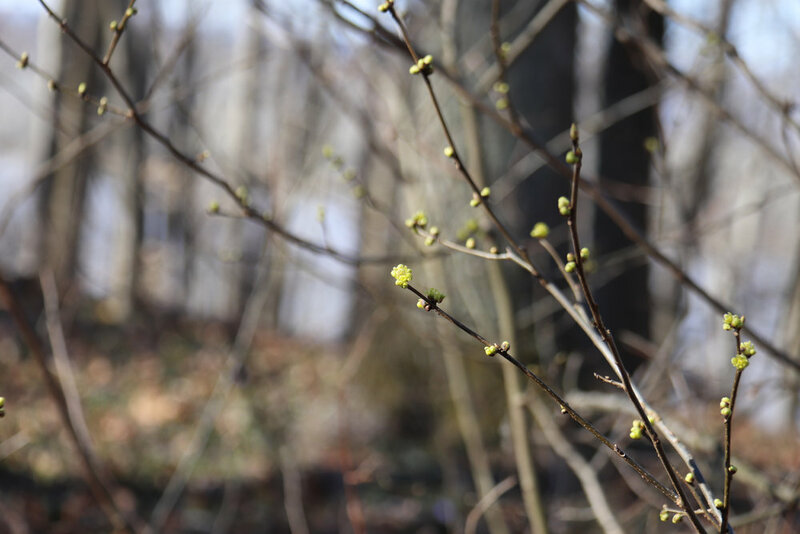 Spicebush is a common native shrub that blooms before its leaves come out. So it’s very easy to see the yellow flowers. 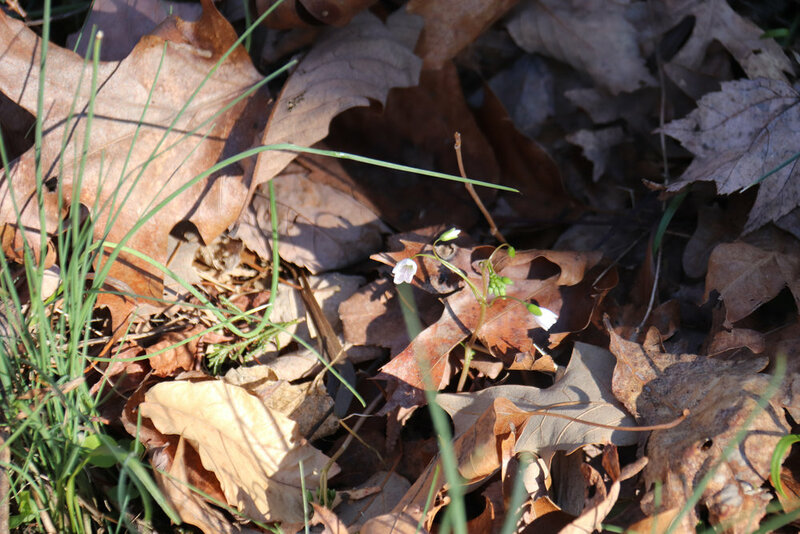 Spring beauty is a native perennial ephemeral with strappy leaves and a white with pink stripes flower. It’ll be gone by June. Slender toothwort is another native perennial ephemeral with white to pink flowers. It’s in the mustard family. The plants stem leaves are very different from the leaves at the base. Both leaves are trifoliate, having 3 leaflets, but the base leaves are wide and the stem leafs are slender. 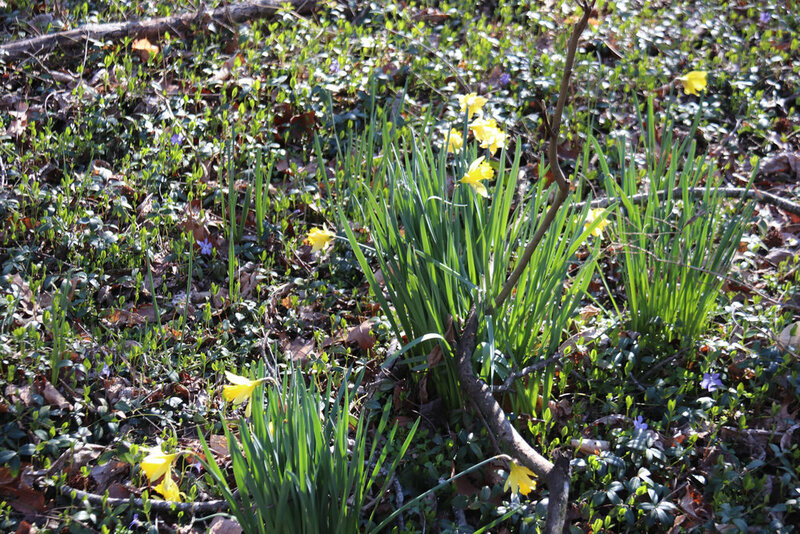 Near an old homesite, common periwinkle (Vinca minor) interspersed with a few clusters of common daffodil (Narciscus pseudonarcissus) were growing over a wide area of the upland forest. Theses 2 are common nonnatives found around old homesites but only the vinca is considered invasive with a low invasiveness rank. The house is long gone but these 2 plants continue to thrive. Thanks to Betsy Washington for helping me identify the plants. As always, my source for in-depth plant knowledge is the Flora of Virginia app and book.